About 3 months ago, we [IT Team] purchased a Toshiba Portege Z835-P360 UltraBook for the CEO of the company I work for but he brought it in this week because he was getting the blue screen of death. Blue Screen of Death can be anything, so we [IT team] did all the basic troubleshooting on the machine to get it up and running without re-imaging it again. Again, it’s the CEO laptop and you know he has information on the computer that he needs ASAP. Now, you can remove the memory and see if the memory is bad? Not really, the laptop comes with 4GBs of memory, but 2GBs are embedded to the motherboard. So that means if the physical memory that can be taken out is not the bad one, we have to ship it to Toshiba for support [7-10 business days and a possible reformat of the HD]. Note removing the casing of this laptop was crazy; we needed to have TamperProof T7 bit to remove the middle screw. We got the bit to unscrew the base of the laptop and test the memory theory; that was an epic failure. So we had to ship the laptop to Toshiba for repair with no backup of the SSD [Solid State Drive] because we couldn’t get into it. As a backup, we purchased another Ultrabook to set it up for our CEO. We received the laptop this morning and wanted to test out one more theory and that’s the SSD of the bad laptop. We took out the SSD of the blue screen laptop and placed it in the new laptop so we could go in and get the information. Again, EPIC FAILURE which tells us that it’s probably the SSD. 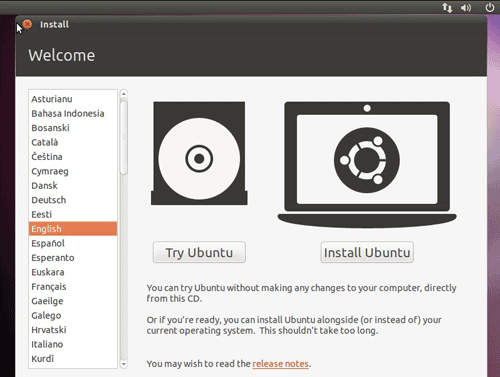 I picked “Try Ubuntu” because it runs directly on the DVD without making any changes to your computer :). Once I was on the desktop from there it was all good because I was able to see the OS Disk and navigate to C:\Users\ASmith folder and get everything :). If you like the post, please take the time to +1 it. 3 Comments on Ubuntu can save you one day! This post really saved me last night! I attempted to boot up my toshiba portege ultrabook yesterday and immediately got a warning that the OS could not be found. Took the laptop to Best Buy Geek Squad – they told me I would have to send the laptop to Toshiba to fix and they were not able to retrieve the data from the hard drive. I really cared more about all my files than I did about the laptop. I came home, called Toshiba, they attempted to troubleshoot over the phone and almost convinced me to attempt to restore the laptop – which would mean loss of all my files. Before doing that, I did a google search, found this post, downloaded Ubuntu onto a thumb drive and booted up the laptop with the thumb drive. I was able to locate all my files and back them up to an external drive. Thank you so much for sharing this information. You could’ve done that with any live cd version of Linux. The Real Epic failure was buying anything with the name Toshiba in it when it come’s to computers. This is so true, but think about it what are my choices for Ultrabooks in the Market Acer or Dell? Come on! For the Live CD version, I could’ve used anything but I needed something small and free because the CEO needed the laptop @ 11:30am on the dot and new Laptop arrived in the office at 10:00, so it was fast moves to get it up and running.